The annual visit to the lake for Dave's birthday was this weekend. No birthday is complete for Dave if the Skiiranasaurus is not involved. The Jerdee's went along for the festivities. Here we all gather together as Al takes our picture. This year all of the boys got into the action. Blake's first time on the knee board. He went 20 feet on his own! Hunter's knee board experience was cut short by a tree floating in the once flood ravaged lake. He refused to go back into the water after that. He perfers ocean water where he can see what is below his feet. Daddy shows everyone how to use the knee board. Grandpa Al took the photos and last but not least Uncle Adam was the captain of the boat. He proved he is not only a pilot but a captain as well. When Florida beaches are 1500 miles away, the next best thing is grandpa Al and Nana's condo pool. Everyone wants to be Micheal Phelps, but the last picture wins. Even at the pool the boys found a way to play baseball. Blake holds the target while Hunter pitches strikes with the ball hitting Sponge Bob right in the pants. As Blake would say "that's Mr. Phelps to you." The Rolfsruds made applesauce like this. After cooking peeled, cored and quartered apples in a sugar/water solution (check out the Better Homes & Gardens recipe book), the fruit was crushed through a three-legged sieve with a wooden turning tool. Hunter made applesauce this morning the old-fashioned way. Good stuff! Working on their Man Cave. Now that is art! The man cave is the boys' (all three of them) birthday present this year. 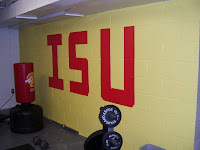 Once the rubber mat flooring, projection TV and Wii are installed we will have the man cave ribbon cutting. Hunter and Blake have even saved up enough Wells Fargo Bucks to get a wall hung basket ball hoop as their contribution. Many good times ahead! Adam invited Kim along on a proficiency flight above Des Moines on Sunday. The instructor took the right hand seat while Kim sat in the back and enjoyed the ride. After we did 4 touch and goes at the Ankeny Regional airport we decided to drift over to West Des Moines and fly over the new Jordan Creek Mall and fly back. The trip was pleasant and Kim even enjoyed it despite getting a little nervous about the trip beforehand. All the landings were fairly good, especially the last one despite a little bit of turbulence that made the plane hop a foot or two just above the landing strip. Blake's second season team is the Mets. He is #10. Here he is playing Short Stop. His latest favorite position. Game One: Blake has three sports events scheduled at the same time: Mets game, Mustang's practice and Tae Kwon Do. He makes it to the Mets game and Tae Kwon Do. Even Blake isn't amazing enough to be in three places at the same time. Game Two and Four were missed due to Mustang's games. Game Three mommy was out of town so there is no report, but I hear it went great! Grandpa Al stepped in to make sure everyone got to their games and practices on time. Game Five: Before, Blake went up to bat I walked over to the bench and whispered to him that I wanted to see a pretty one way out to left field. He smiled and gave me the thumbs up. I couldn't believe it when he stepped up and on the first pitch the ball sailed out to left field. It was pretty too. The second time up to bat I went over and said "do it again". He smiled and gave me the thumb up again. He stepped up and on the first pitch sent one in the exact same spot to left field. It was pretty crazy. The third time he was up I smiled at him and didn't say anything and he smiled back and gave me a thumbs up. Third hit sailed out to left field. Sadly, the other team was on to him and was ready to get it this time. Three fielders all ready in left field waiting. I guess you have to change it up from time to time. Blake didn't care - he was beaming! Blake's latest skill is being able to indicate in which direction he is going to send the ball when he hits it before he bats. He is pretty accurate. 2 out of 3 times it goes exactly where he says it will. Blake on third after a big hit to left field. He has earned his nickname "Big Bat Blake" or is it "Mr. Baseball?" His goal is still to get the ball stuck in the fence. He has one more week to make it happen. Game 6: The coaches have to retreive Blake from the Giant's dug out because he is so busy yacking it up with one of his buddies on the other team he didn't notice the inning was over. He was supposed to be playing 1st base. Game 7: 94 degrees. The boys did a lot more sweating than playing. I told them they were doing great even though it was so hot and Blake's buddy told me "that's what boys do". I guess they were being boys. Games 6 and 7 were reschedule due to rain so the team had 4 games in one week. Game 8 was cancelled completely because the other team did not have enough players. Blake is getting ready to catch in the third inning of the hottest game of the year (98 degrees). Still smiling. They called the game for heat so he will catch tomorrow night. Despite the heat Blake hit one big one to left field, one big one to right field and a grounder down the middle. 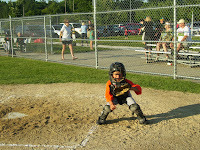 Blake the next night when he is actually catching. This time it was 78 degrees. He is ready to go. He did a great job! Blake hit another big one to left field and another to center field. The season has been a little bumpy, but Blake has made the best of all his chances to play! We have learned that though Blake really loves baseball (like I said Mr. Baseball) he actually sees this is a social event, too. He knows many of the coaches and they know him. He also knows a kid on each team and spends before and after games going around greeting them all. Blake has been dreaming about forming his own baseball team with his friends. He has the team all figured out. What will he be when he grows up? The season will be over in two weeks. What will keep him entertained until next April when he will get to start baseball again? He is in soccer this fall, but in his words "only to stay in shape for baseball". He is thinking about basketball, but "only to be with Adam" one of his five best friends. He has turned down flag football and wrestling too. I don't think Dave is going to let that go. Interesting years ahead. One thing we know for sure - there will be many, many more baseball diaries from Blake, Mr. Baseball! 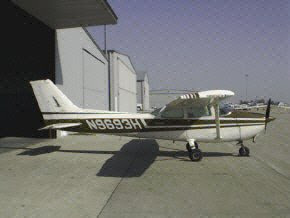 After a 5 year hiatus in flying I, Adam, have gotten back in a plane again, practicing my privileges as a private pilot. 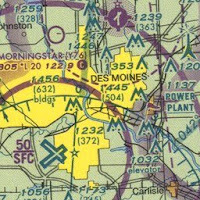 On July 30 I took the controls of a 1976 Cessna 172M, N9693H, at Exec 1 Aviation at the Ankeny Regional Airport with the help of a flight instructor. We practiced steep turns, stalls and touch and goes. I felt like everything came back to me in a matter of minutes. The air was calm, but a little warm. Then we went back out again last Saturday. That was a little bit of a reality check. There was a 9 knot crosswind from 90° - 130° (the east) with gusts up to 18 knots. It's not much, but it reminded me how challenging crosswind landing can be. We did 7 touch and goes on runways 4 and 18 before calling it a day. I look forward to taking a few more training flights before I'm ready to take any passengers up, but it should happen soon enough. Most of my previous flight time has been in a 152 so the relearning in a 172 has been a little challenging. Maybe I'll bring a camera and take some pictures one of these trips. Second season is in full swing. Dave and Hunter were assigned the Dodgers this time around. What are the odds that Amy would have to go to CA for business during the first week of their season so she could pick up an official Dodger's shirt for the assistant coach (Dave). He is now the best dressed coach at Holiday Park. So far the season has been a little slow. Sometimes watching 8 year olds playing baseball can be like watching paint dry. Here Hunter earns his walk. It would be easier to be hit by the ball, but Hunter opts to earn a real walk. Next, he slings the bat down so he can take his walk. Finally, he steals second while the catcher hunts for the ball while the next batter earn his walk. Dave has been a noble and brave man to volunteer to assistant coach this poor group of souls. He encourages them to "hussle", "look alive", "ready position", "this will be the one" and many other encouraging baseball phrases. He never loses his spirit. Here you see a coach from the other team talking his ear off while Dave tries to stay focused. Dave is baseball ready. This other guy is not setting a very good example for his players. Amy supports the team as well as she is now the assistant coaches' wife. She helped a little boy with gum that he had gotten all over his face during one game. He was trying to "blow the biggest bubble ever". That was pretty entertaining. It wrapped around his whole face and under his chin. That kept her busy for some time. During the last game, Hunter was on the bench for the first inning. Apparently, this is a desired spot as there is shade and he could take a nap. He laid down on the bench and got a good 20 - 30 minutes in during the 7 walk innning before he had to take his turn walking the bases. Then Hunter got to pitch. He started throwing strikes and struck two batters out in a row. They weren't used to having to swing because the usual strategy is to just stand still so you can get the walk or move so you don't get hit. The third batter had two strikes on him when he took a chance and actually swung the bat. Action.. straight into the air and a caught fly ball. A legitimate out in the field. Yeah!! Three batters, three outs! Yeah! Hunter 'the Heat' lives on. We won the game in the end by one run.